We limit West Seattle class size to 6 and Burien class size to 8 so that you get individualized attention. All classes are taught by Doctors of Physical Therapy with STOTT Pilates training. Call us for our current class offerings -- Thursday evenings in West Seattle and in Burien! for West Seattle office@lifeinbalancept.com or call 206-913-8082.
for Burien burienoffice@lifeinbalancept.com or call 206-743-8942. Developed by Joseph Pilates toward the beginning of the 20th century, Pilates is a system of core-based exercises that use gravity and/or special equipment, designed to improve strength, flexibility, endurance, posture, and body awareness. Most of the instructors at Life in Balance are trained in STOTT Pilates, which has updated the original Pilates' methodology by incorporating scientifically-based exercise and rehabilitation principles, and applying proven and accepted practices in biomechanics, rehabilitation, and athletic performance enhancement. STOTT Pilates exercises serve to restore the natural curves of the spine and rebalance muscles around the joints. This involves placing more emphasis on dynamic pelvic and scapular stabilization and developing the spine-supporting trunk muscles of the abdomen, back, and buttocks. 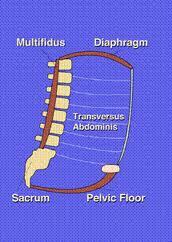 Our core muscles -- the pelvic floor, transversus abdominis, and multifidi -(as well as many others! )- help us maintain postural stability and minimize the impact of loads on the spine. Retraining and exercising these muscles is widely used in managing every conceivable orthopedic condition, but particularly low back and neck pain.